Florida buildings are now better able to withstand hurricane force winds. Hurricane Andrew -- the monster storm that hit South Miami in August, 1992 -- showed just how shoddily many homes in the area were built at the time to accommodate a booming population in the decades before. The Category 5 storm -- the last at that strength to hit the U.S. -- completely destroyed about 63,000 homes and damaged an additional 100,000, Jorge Zamanillo, director of the HistoryMiami Museum, told ABC News earlier this month. The widespread destruction inspired state and local officials to write stronger building codes, making Florida's structures better able to withstand hurricanes of similar caliber. Hurricane Irma "could be worse" than Hurricane Andrew, Florida Gov. Rick Scott told ABC News Wednesday. "I want everybody to understand the importance of this. This is bigger than Andrew," Scott said in an interview from Tallahassee today with ABC News' "Good Morning America" co-anchor Robin Roberts. "This could be worse." According to state officials, despite Hurricane Irma's "extremely dangerous" 185 winds, Florida's buildings are not in the same peril that they once were in 25 years ago. "You'll see that buildings stand up better against hurricane-force winds," Bryan Koon, director of the Florida Division of Emergency Management, told ABC News. Andrew's 175 mph winds flattened entire neighborhoods when it made landfall in southern Miami-Dade County on Aug. 24, 1992. Country Walk -- a planned suburban neighborhood north of Homestead -- was a scene of utter devastation in the wake of the storm, mostly due to the shoddy construction practices used to build the homes, Richard Olson, director of the International Hurricane Research Center at FIU in Miami, told ABC News earlier this month. Staples, instead of nails, were used to attach roofs to homes, which were built with low-grade plywood, Olson said. Cheryl Lani Juarez, 62, who was living in Country Walk when Andrew hit, said the second floor of her home didn’t stand up to the "three hours of horror." "You could see the sky from the upstairs loft where the kids’ bedrooms were," she told ABC News. "You could see where two pieces of wood were not connected by nails." Juarez said that when she walked outside, "it just did not look like our neighborhood anymore. Her neighbors' homes had faced similar destruction, and among the rubble that littered the ground, and recalled seeing piles of asphalt shingles that had not been properly attached to roofs. "You don’t see that kind of stuff when you’re looking to buy a house," she said. The homes in Country Walk were allegedly built so poorly that a grand jury investigation looking into the construction practices was launched and there were talks of criminal indictments on the builder, Olson said. Homeowners eventually sued the builders, the New York Times reported in October 1992. Juarez confirmed that a settlement was reached out of court, but said she was not permitted to talk about it. The shortcuts in construction resulted from pressure to accommodate Florida's population explosion in the 1970s and 1980s, Olson said. "How do you build fast enough to handle that population growth?" he asked. In 1992, the South Florida Building Code, which included Dade and Broward counties, had been considered one of the best in the country, but those standards were not adequately enforced, the Sun Sentinel reported. In terms of building codes, "Florida took Andrew as a lesson learned," Koon said. Prior to Hurricane Andrew, building codes were not "rigorously enforced," because "that tended to slow down construction and raise costs," Olson said. "It changed –- forever -- building codes and especially building code enforcement, which Andrew proved to be inadequate, incompetent or avoidant," Olson said. (Terry Renna/AP) A day like no other, Aug. 24, 1992, was the day Hurricane Andrew wreaked havoc on southern Florida, leaving entire trailer parks flattened and rows of concrete power poles toppled. Tens of thousands of people were left homeless as the storm, known as the Big One, ripped through the area before moving west toward the Gulf and Louisiana. 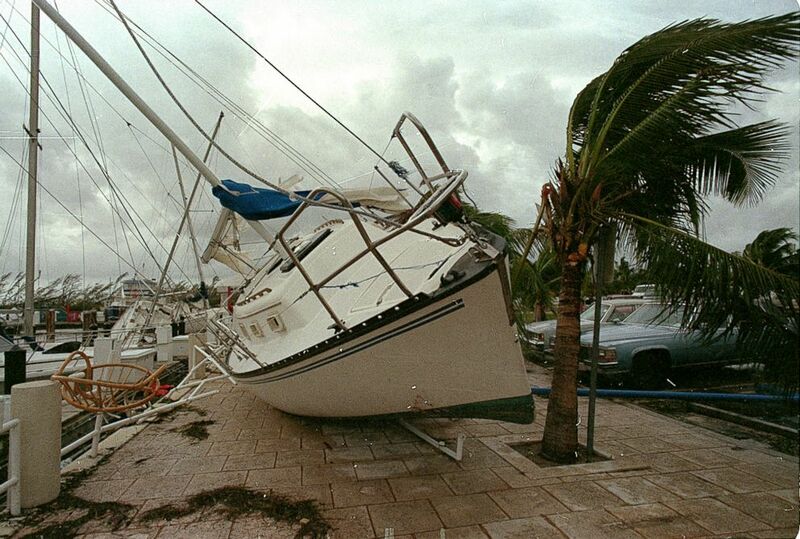 A sailboat sits on a sidewalk at Dinner Key in Miami after it was washed ashore by Hurricane Andrew. Two years after Andrew, the first post-Andrew version of the South Florida Building Code was published, and it focused on wind resistance and roof integrity, according to the Sun Sentinel. Improved roofing standards were among the first provisions, as well as impact-resistant windows or hurricane shutters on new buildings. In addition, cheaper materials like particle board were prohibited. The first statewide building code took effect in 2002 and continues to serve as the basis of the state's building code, the Sun Sentinel reported. It superseded local codes, while also incorporating the stronger Borward and Miami-Dade County provisions. The construction cranes in Miami are only able to withstand winds up to 145 mph, the City of Miami said in a press release Tuesday. Officials told residents near the construction cranes to evacuate. "The crane's arm has to remain loose; it is not tied down," the press release said. "The arm's counterbalance is very heavy and poses a potential danger if the crane collapses." There are currently up to 25 construction cranes throughout the city. Hurricane Irma's winds are clocking in at 185 mph. Since the 2004 and 2005 hurricane seasons, billions of dollars have been spent in hardening the infrastructure of Florida's 57 utilities companies, five of which are overseen by the Florida Public Service Commission, Koon said. Emergency management teams in Tallahassee are preparing the power grids for the storm, Scott said in a press conference Tuesday evening. When the storm passes, the first thing residents want to do is go home," Scott said. But, they "can't go back home without power," the governor said.